These aren't really the posts you want to write. The redemption tour had been two for two this year, but number three didn't happen on this occasion. DNF at North Fork 50 miler for the third year in a row. I made the 50k cutoff with forty minutes to spare? Went up the hill a few more miles and then turned around and came back and dropped. Dropped! Despite my faux arrogance I really wasn't coming into this race with a lot of confidence. The knee injury had been limiting my running. Shape was pretty much lousy. Confidence was pretty low. However my intention was to have fun roaming around in the woods all day. How often do you get to do that? I did the early start again, said hello to Janice the ever encouraging race director and started off. I intentionally decided to go slow. My thought all along was that even if I go slow to start I can still bank enough running miles and have enough energy to walk it in if I have to. This was good logic except for the walking it in part which came later. I started out in last and was quickly by myself running through some beautiful country in the Pine National Forest. I was drinking water, hitting S-Caps (two an hour) and taking gels for calories. Since then I've wondered if the S-Caps + gels were too much salt, but during the first six hours I felt pretty good. I ran through some of the best aid stations at any ultra I've been at (bacon! ), though they asked me what I needed and when I responded with a poetry recitation and then interpretive dance I found no one willing to meet my needs. Oh well. Great aid stations with a few exceptions and they really helped me along. As a side note, why can't people fill up a hydration pack all the way? "Fill it up completely" does not mean 1/3 full. Guess I need to check these things. Now despite the temporary hydration success, I was really struggling with the uphill sections. They. Were. Brutal. I was walking, slowly. At some times I was barely moving. The only positive I could take from these sections was that I kept moving consistently and did not stop. I went through the first twenty miles in just over five hours. This essentially left me ten hours for the last thirty miles, still doable. Hope was still persisting. Then my old nemesis returned. Mount Krakatoa. The puking hit. The dehydration was severe. My whole mental state, which I think was derived in a large part from a bad physical state, started heading South. There was some wooziness and drunken stumbling on the trail. There were some attempts at catching up, it was all for naught. I really couldn't keep anything down other than water. I got to the 50k aid station which is right at the finish line with lots of people milling about. I tried to eat and drink, took about twenty steps away from the AS and started puking again. In front of innocent bystanders. Have I mentioned that I'm a loud puker? Like REALLY loud. I once got sick at a Chinese restaurant and teh wifey said everyone in the restaurant could hear my horrific sounds from inside the restroom. That's what we call good for business! "Here kids you should definitely give ultrarunning a try! Look at that guy, he's having fun!" The other really fun thing that will totally convince you to do ultras if you don't already was that I experienced a slight chafing issue. In the nether regions. And by slight, what I mean is, a bloody mess. It was horrific. I had gone about twelve miles and three and a half hours without body glide and I paid the price. I carry some with me in my pack, but at that fateful point of realization it is pretty much too late. Thus in this wonderful state I left the aid station. I had convinced myself that I REALLY wanted to leave that aid station. Unfortunately coming out of the aid station you have to go up. And up. And up. Like up actual stairs along a cliff face up. And having just run three to four miles down a long descent which comes after the stairs I knew what was next. I let myself be defeated. I actually went up the stairs and then up the hill about two miles or so. Then I stopped and sat down by the side of the trail for about thirty minutes. Then I turned around and went back. 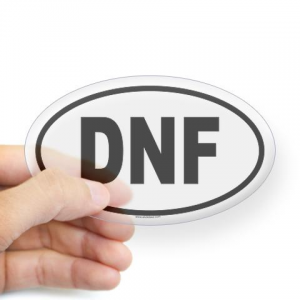 The Top Ten Things I Learned From a DNF at the North Fork 50 mile race. 10. Bacon wraps at aid stations are a beautiful thing. 9. Chafed nether regions are not a beautiful thing. 8. The only thing I felt about eating another "Chocolate Outrage" flavored Gu was Outrage at the prospect of sticking that nasty stuff in my mouth. 6. Including a stair workout in the middle of a fifty miler is cruel and unusual. 5. Sudden cloud bursts of rain in the middle of a fifty miler are quite nice. 4. I'm not good at this ultra thing, but I'm also not done trying. I win. 3. Dehydration and physical duress have tangible effects on your psyche. 2. I learned that one of the aid stations was giving beer to runners during the race? Is this a good nutrition strategy? 1. ? Sometimes it takes a while to figure out what you are supposed to learn...?